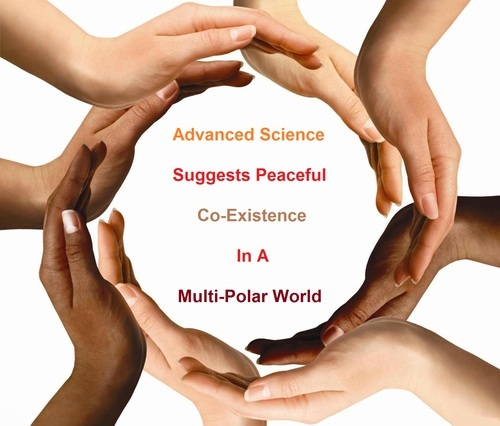 2013: Why Does Advanced Science Suggest Peaceful Co-Existence In A Multi-Polar World? Albert Einstein’s famous equation E=mc^2 shows us that everything is made up of energy. Science demonstrates that energy is the building block of all matter. Energy exchanges take place within, without and at the interface of everything at all times in a most complex dynamic. Everything in this universe is ultimately made up of that same energy flow. It is just present in different forms and different shapes and keeps on transforming and recycling perpetually. The energy that composes our bodies is indeed the same one that composes the building materials of our homes and the animals and the trees found outside. It is all just the same and ever exchanging! Energy is constantly flowing and changing form all the time. It is in a dynamic state of flux. This is a very simple explanation of a rather complex system! So are we then all part of that “One Energy”? And can this be dated back to the beginning of this universe which began the “Grand Narrative”? Was all matter entangled in a dynamic dance of energy at the time of that primordial initial vibration and remains so even to this day? Is this indeed where we originally ascended from and where we still are? Is our ultimate reality timeless, multi-multi-dimensional and infinite yet it appears to be bound or entrapped by time in a spatial-temporal universe within the constraints of the physical four dimensions? Max Planck, considered to be the founder of quantum theory and one of the most important physicists of the twentieth century, did extensive research into the field of energy and he is the father of the expression called the “Planck Scale”. The Planck scale corresponds to incredibly small distances or equivalently, incredibly large energies, and some scientists believe that at this very low level we find vibrations and invisible connections in everything. It has been shown to be unimaginably vibrational and energetic at the atomic level. Recent scientific advances including those at the European Organisation for Nuclear Research or CERN suggest that the universal energy which transforms into matter constitutes the underlying fabric of the universe. If all of our bodies are energy and everything around us is energy are we then connected with each other and everything around us? If this is the case, we are entangled and everything we do — how we behave and how we think and feel — will be vibrating into this field of energy, this so-called Ocean of Energy. Hence it is affecting everyone in it — either directly or indirectly. A shift in one part of that massive field of energy ripples on and causes shifts in the parts next to it and they cause shifts in the parts next to them and that ripple continues to cascade. Given that we are part of that universe, the ripple comes back to us and gives us back a dose of experience similar to that which we originally emitted. If we cause a change in the energy field around and in us, it ripples, touching everything. And everything of course ripples back in reaction, sending it back to us, with amplification! If we take this one step further it would mean that the way you and I think and feel can change the world for better or worse. Our vibrating, positive energy can influence those around us and vice-versa. This is the essence of the law of “Cause and Effect.” It is essentially like a boomerang. What we send out comes back to us with a strengthened force. If we are sending out positive and good vibrations, reflecting our true emotions and feelings, the “boomerang” is likely to come back to us with positive events and positive synchronicities or “coincidences.” The same goes for emotions and thoughts of anger and hatred. The “boomerang” we emitted will catch up with us sooner or later and give us a positive or negative experience and an alteration of our perceived reality dependent on our original interaction. 5. Watch your character, it becomes your destiny. Every thought or action has an effect or consequence. The nature of that effect depends upon the nature of the cause. If the cause is “positive”, the effect is more likely to be “positive”. If the cause comes from negative thoughts, the result is more likely to be negative in its impact. The Law of Cause and Effect states: “For every action there is equal and opposite reaction” which is also Newton’s third law. Our thoughts, our words and the way we behave is a cause that sets off a wave of energy throughout the universe. As part of this sea of energy we must realise that the way we think and feel is causing a ripple in this “Ocean of Energy” in the universe and it affects everything around us. Our family, friends, people in our local community, people in our country and everyone in the WORLD and within the universe is affected. The most potent form of energy is thought. Thought-waves are cosmic waves that penetrate all time and space. Hence what we think has a great impact on everything in this universe. So just by committing to think and to feel in a positive way ought to make a shift in the universe and cause our world to benefit. If everyone on Earth starts to think, behave and feel positively we will make our world a place of peace as opposed to conflict and war. With our consciousness we are all part of that universal consciousness in one universal mind. Global consciousness impacts on our world and we are able to change it for the better if we just commit to it! Peace is a by-product of the recognition of our interconnectivity at all times and in all places. Just as soon as individuals and nations recognise that we are living in a totally interconnected world and universe, the incentive for conflict driven by selfish vested interests begins to decline. There is no 'other', because the 'other' is indeed us! There is simply too much to lose in an interconnected world in the event of a global mass conflict, that is not so much planned as it becomes a by-product of muddling through in a similar fashion to the start of the First World War. Especially when the leaders of major nation states are unable to lose face in front of their own citizens and find it convenient to blame an external power. In this particular context, the Asia-Pacific region is most volatile at present. The balance similar to the one which existed during the Cold War between the two Super Powers, who feared Mutual Assured Destruction or MAD, and hence never went to all out war, can be re-manifest in the multi-polar world upon the realisation of our total interconnectivity and interdependence on each other.